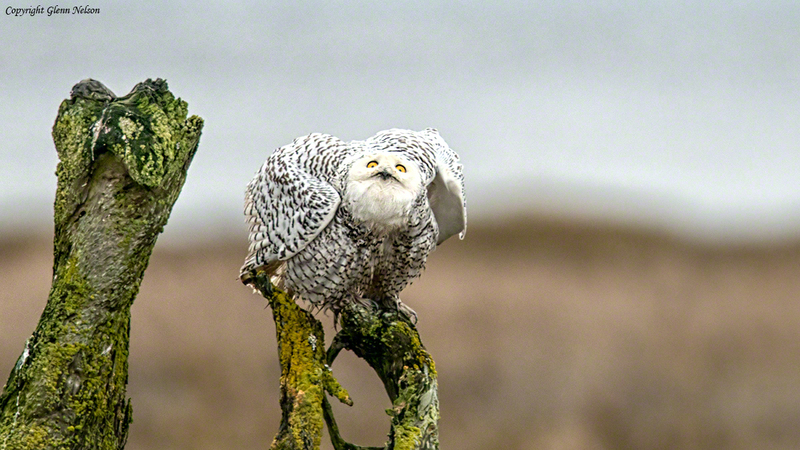 A Snowy Owl after being buzzed by a Bald Eagle in Boundary Bay, B.C. 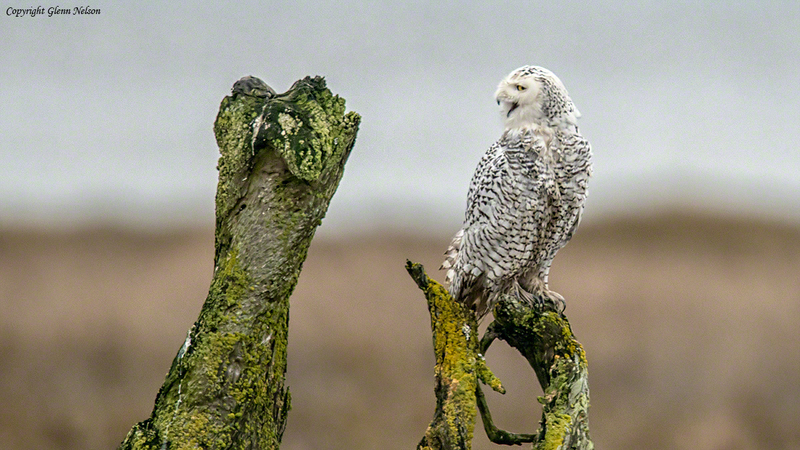 BOUNDARY BAY, B.C., Canada — The first time I ever saw an owl in the wild was just last November, when I looked at a Snowy Owl through another person’s spotting scope at the end of the boardwalk at the Nisqually National Wildlife Refuge. I knew we had an irruption of Snowies in the Pacific Northwest last year, and were enjoying an echo this year. But seeing one so far off in the distance just made me want to see one at much closer range. (Irruptions, by the way, are when a bird species visits in unusually large numbers areas to which it normally does not migrate. 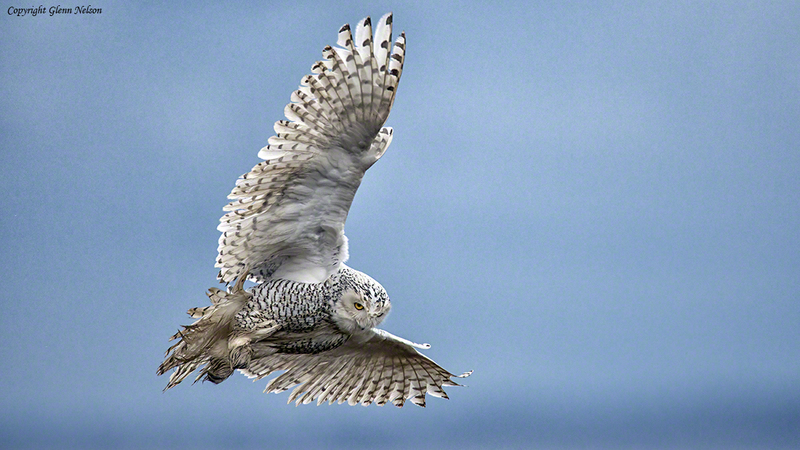 The Snowy Owls venture south about every four years. Speculation is that the population of lemmings, which constitute 90 percent of a Snowy’s diet, dived in the Arctic, the Snowy’s usual stomping grounds, driving the majestic, white birds south). 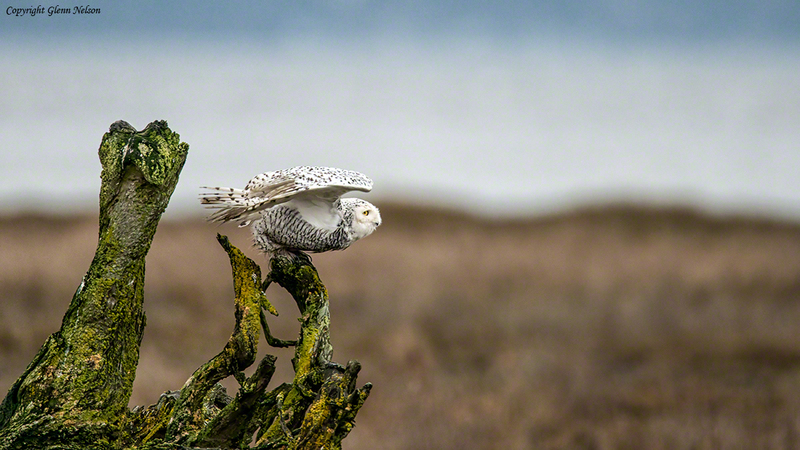 My desire to see a Snowy Owl up close intersected with my decision to work on my nature photography. So I rented a massive, 600mm f4 lens, stuck on a 1.4 teleconverter and affixed all on a tripod, and headed to the Great White North, where I hadn’t been since attending my aunt’s funeral in Richmond, B.C., more than six years ago. I can’t tell you how many dozens of times I drove past the farmlands between the U.S.-Canada border and Vancouver and failed to notice that it teemed with raptors. Want to view our national symbol, the Bald Eagle? Head to Canada, eh. Seven eagles were chilling in a tree right next to my parking space at the Boundary Bay Dyke Trail early one recent morning. 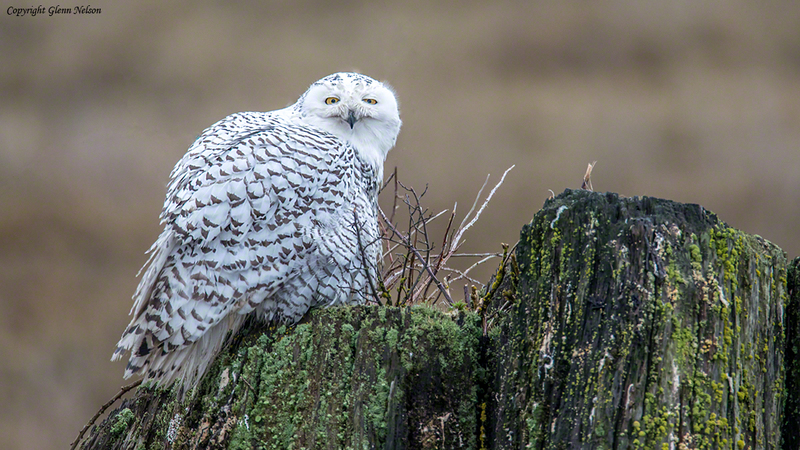 I walked maybe four blocks down the trail before I encountered four Snowy Owls, sitting on logs. And sit, they did. 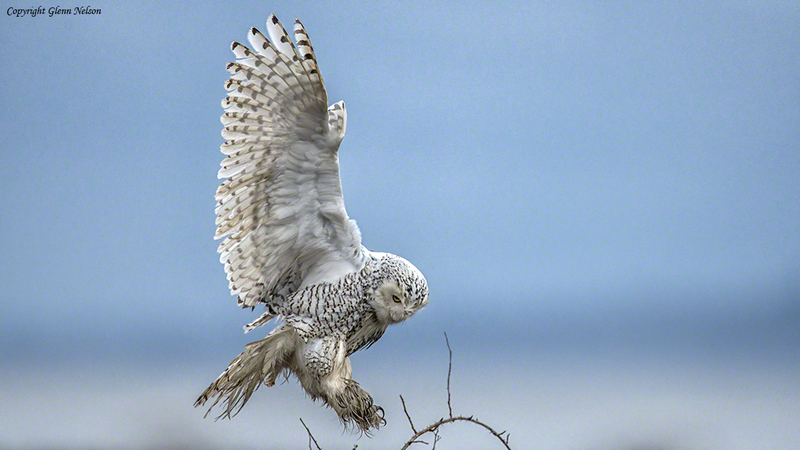 It was very windy, making difficult the kind of flight Snowies use to hunt. One man with a camera had traveled all the way up from Los Angeles to photograph the Snowies. “All they do is sit,” he complained. That would have made many point-and-shooters very happy, but we knew pictures of stationary birds are a dime a dozen. So we wait, then he gave up, and I waited and waited. About three hours later, something happened that led to the photos that follow. I’ll let them tell the rest of the story. (Note: clicking on an image will launch a larger version of the image in a separate window). An eagle flies very close overhead, and the Snowy seems concerned, to say the least. The Snowy prepares to bolt. 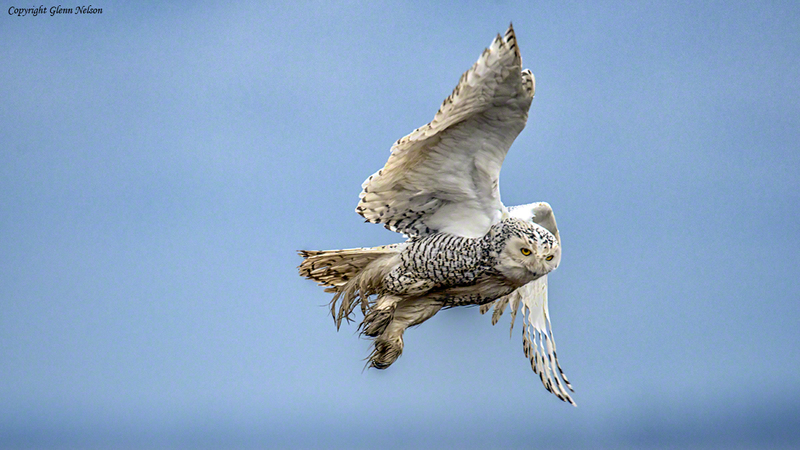 In flight, the Snowy looks a little more in command. Refuge is found and, let me tell you, it wasn’t too far away. i am overwhelmed by the beauty of these photos!!!! !